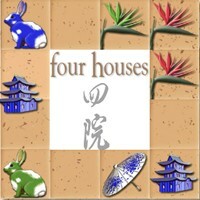 Bring order to the four houses by creating lines of matching shapes, colors, and numbers of objects to earn coins! When coins have been placed across the entire board, you are rewarded with more complex puzzles as well as beautiful backgrounds and ancient wisdom. from autumn, to winter, to spring and summer showering the land with prosperity in your quest for wisdom and serenity!